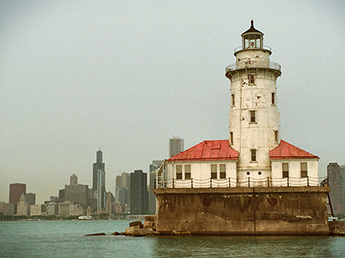 Bauer Latoza Studio worked with the City of Chicago to develop a detailed conditions assessment at the Chicago Harbor Lighthouse. The Lighthouse was originally constructed in 1893 as part of the World’s Columbian Exposition, and moved to its current location 0.4 miles offshore from the east end of Navy Pier in 1917. 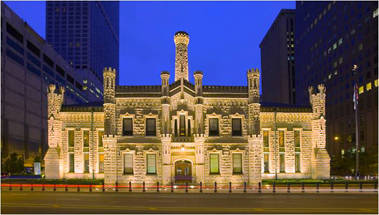 The Lighthouse is a Chicago Landmark and is also listed on the National Register of Historic Places. The scope of work for the project included an assessment of the conditions of both the interior and exterior of the Lighthouse. The structural integrity of the rubble stone and concrete foundation and seawall were evaluated. Following the assessment, Bauer Latoza Studio issued a report detailing the findings and providing recommendations and related cost estimate for stabilization. An accompaniment to the Water Tower, the Pumping Station was one of the few buildings left standing in the area after the Great Chicago Fire. After assessing the condition of the Joliet limestone façade, Bauer Latoza Studio implemented the method of cleaning we designated for the Tower, adding consolidant and water repellants to stop further deterioration of the facade. To compliment the restoration, the copper and wood windows were restored and refinished. Bauer Latoza Studio authored historic structures reports for Fort Buford, a 189-acre post from 1866 and location of Sitting Bull’s final surrender, and Fort Totten, an 1874 Native American boarding school that once served as a tuberculosis preventorium. 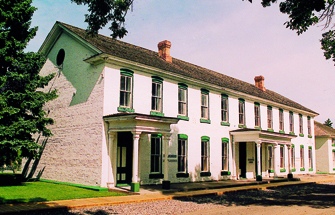 The firm then designed and established a vocational “hands-on” training program targeted to train Native Americans the techniques and methods to restore and renovate the forts. 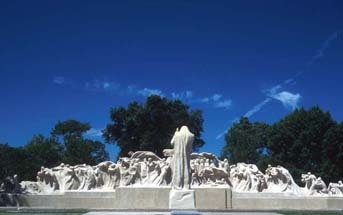 This quote inspired Lorado Taft in his sculpting of The Fountain of Time, a cast-in-place, exposed aggregate monument that embodies innovative American techniques dominating statuary in the early 20th century. Taft worked with concrete engineer JJ Earley to realize the construction of what is considered the greatest concrete sculpture in America. After extensive assessments and material analysis, Bauer Latoza Studio conducted a two-phase restoration for the Fountain. 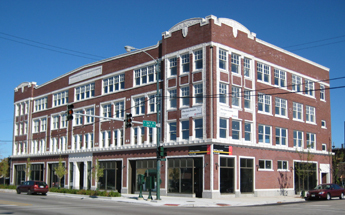 Headquarters for the Overton Hygienic Manufacturing Company, this building provided the first new office space available to African-American professionals in the Bronzeville Community. Abandoned for over 20 years, Bauer Latoza Studio prepared an assessment for restoring the building in 1998. In 2006, we worked with VOA Architects to complete the design and see the construction through to completion. 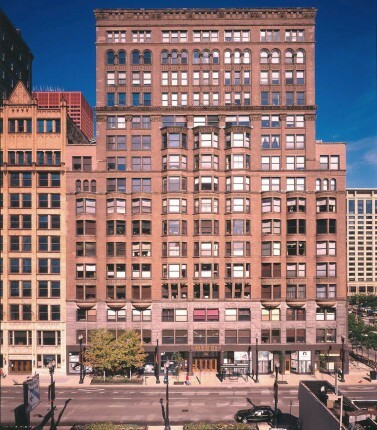 Bauer Latoza performed a critical examination of the granite, brick and terra cotta facade of the skyscraper, originally built in 1891. The design and construction documents then focused on restoration and repair of the exterior facades. The project also included restoration of the original wood windows, reconstruction of projecting bays with new copper roofs, and restoration of the original copper signage at the building’s entrance.